(From company literature) Extend the range of your primary lens with the SAL-20TC. Get more coverage distance and capture more subjects without the burden of extra equipment. 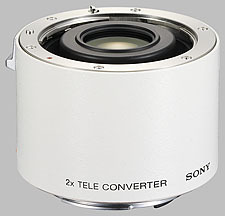 Professional-quality tele-converters to extend the range of your lenses Using this compact tele-converter lens, you can extend the photographic range of your primary lens by 2X -- allowing you to cover more distance and capture more subjects without the burden of extra equipment. Designed to support Sony G-Series 70-200mm f/2.8 G Telephoto Zoom and Sony G Series 300mm f/2.8 G Telephoto lenses as well as the unique Sony 135mm f/2.8 STF (Smooth Transition Focus) lens. Lighten Your Load: Carrying this versatile tele-converter lens allows you to increase your telephoto shooting capability without carrying extra equipment -- a significant advantage on long wilderness treks or while traveling on vacation. Superb Optical Performance: With these precision Sony tele-converter lenses, you'll preserve both the accuracy and the image quality of your primary lens. Open Aperture Settings: When using these tele-converter lenses, remember to compensate for their reduced light transmission by opening your aperture two steps with the 2X converter. The Sony 2X SAL-20TC doesn't have any user reviews yet!